Mush Pit (originally known as Toadstool Titan) is a 4-player minigame in Mario Party 3 and Mario Party: The Top 100. Its name is a pun on "mosh pit." The minigame takes place in a room where the walls are decorated with Warp Pipes of different heights, brick walls that represent the sky with white and blue bricks, and a large Mushroom icon on the floor, referencing the reflection of the minigame. Four of the players fall down onto the floor from the ceiling, positioned near to the corner of the walls, and then six of the Brick Blocks appear in the room from the puff of smoke. The minigame then starts. The players' objective is to find the Super Mushroom (Mario Party 3)/Mega Mushroom (The Top 100) inside one of the Brick Blocks by simply punching them within the time limit of sixty seconds. Players can move around the room and use their jumps and attacks to stun other players from moving continuously. When a player finds the Mushroom after breaking the Brick Block containing it, the rest of the floating blocks will disappear, making the other players react by either attempting to steal the Mushroom or run away from the player taking advantage of this power-up. When the Mushroom is not grabbed yet, the item simply moves slowly around the room until a player grabs the power-up. When one of the players successfully obtains the Mushroom, the player grows big within a limited time (about five seconds). When the player goes into the desired direction, the player will run in one direction until he or she hits a wall, which stalls them for a moment. The giant player can eliminate other players by running into them. When the player shrinks to normal, the nine Brick Blocks appear with the Mushroom hidden in a different block, and the process repeats. The remaining player in the room will win the minigame. 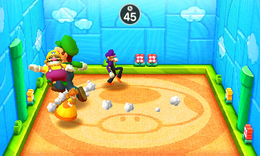 In Mario Party 3, if two or more players remain in the minigame when the time depletes, it is considered a tie. On a side note, in The Top 100, the Mega Mushroom immediately appears when its block is hit, and it takes less than half as long to grow. Game Rules – "Break the blocks to find the Mushroom. Defeat your rivals by crashing into them." Advice – "You cannot defeat a player who has powered up. Just run away." Description – "Find the Mega Mushroom hidden in a block and ram into your rivals!" On-screen – "Catch the Mega Mushroom and ram into your rivals!" This page was last edited on May 2, 2018, at 20:00.